Change it up. Every year in Morgantown, teams organize for the Hundred Miles in a Hundred Days competition. “We change the theme every year, so it’s never feels like you’re doing the same thing,” said former organizer Adam Flack. Include kids: “When kids get involved, their parents get involved too,” said Shepherdstown organizer Mark Cucuzzella. Every time there’s an adult run, there are kids’ fun-runs too, sometimes in costume. Give people discounts. The Jackson County Moovin’ and Groovin’ people created a card for members that gave them discounts at selected local stores. They also arranged a day when members could come into the local shoe store and get discounts on running shoes. Find successful programs and visit them. This Web site is full of examples. Be persistant. The “hundred miles” program, created by WVU Wellness, has run for more than 20 years in Morgantown. More than 5,000 people now participate. One-day events won’t help people establish a walking or running habit, organizer Adam Flack emphasized. “If you set it up so people walk over a period of weeks, there’s a much greater chance they’ll keep doing it after the challenge is over,” he said. Looking for creative ways to draw people into walking? 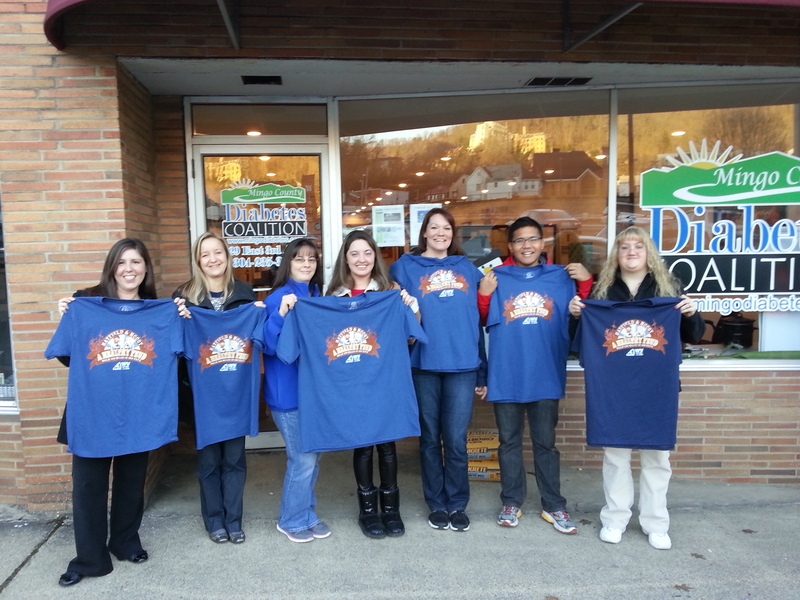 Walk 100 Miles in 100 Days participants proudly show off their newly earned commemorative T-Shirts. Try the Walk 100 miles in 100 days challenge. This is a 20-year-old trademarked program of the Wellness Program of WVU Hospitals, but they are glad to share. Each year, they adopt a different theme, so it’s different each year. Go to their site for lots of ideas. Want to adapt it for your area? Call (304) 293-2520. 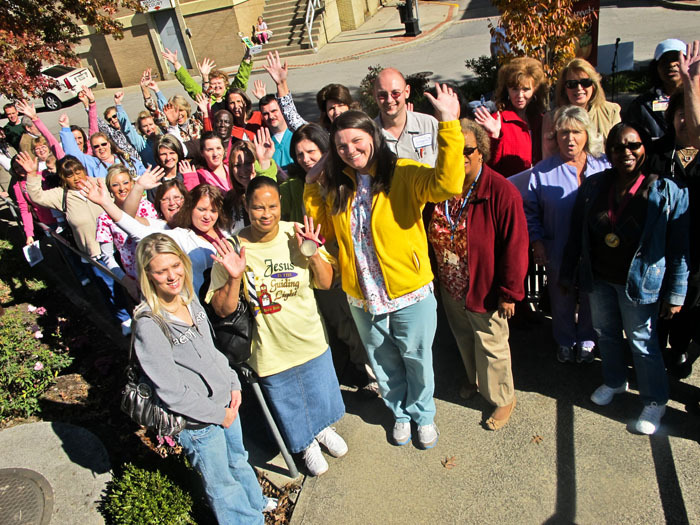 The Mingo County Diabetes Coalition adapted the 100 Miles in 100 Days Challenge. They call it The Healthy Feud, a healthy revival of the Hatfield-McCoy Feud. WVU Extension organizes a Summer Steps walking challenge to all counties. County teams compete with pedometers all summer. Try WVU Extension Service’s “Wild Wonderful Walking” packet. It gives you what you need to start a six-week walking program. It can be a stepping-stone to an ongoing program or an ongoing program can offer it. Create historic walking tours: Fairmont’s MainStreet program created a wonderful historic walking tour with an online map, old photos and audio tour. Winter walks: In Parkersburg, the Online Physical Activity Magazine sponsored a series of well-attended family-friendly winter hikes in 2013. The state park Web site www.wvstateparks.com/Hikes_Walks.html, lists a wide variety of walks that will give you ideas. Offer the walks as a series, to help people build a habit. Here are instructions for creating a historical walking tour. If you search for “create a historic walking tour,” you can also find programs that help you create an app for your community. How walkable is your community? See the complete streets and walkability pages.